We want you to try our NO-busywork, adaptable literature study guides, so here is one for FREE! Written to accompany Canadian author L.M. Montgomery’s beloved 1908 coming of age novel, this literature study guide by Sabrina Justison helps you get the most out of Anne of Green Gables. Literature study guides from 7SistersHomeschool.com inspire students rather than tire them with busywork that kills the story. At last! 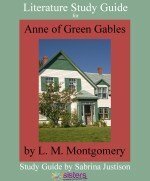 A literature study guide for Anne of Green Gables that is easily adaptable for use by K-12 students in your homeschool!Instead of attempting to examine every element of a book on the first reading, our study guides choose two or three respected literary devices and use them as a focal point. This literature study guide is adaptable for use with elementary, middle, and high school students. This study guide has even MORE included so that your younger students (even the little ones who aren’t reading for themselves yet) can participate. encourage the reader to note motifs that run through the story. Click here to view an excerpt from Anne of Green Gables Study Guide FREE.